Week 16 - Storm at Crush; 6.3.17, 4 p.m.
What: Spokane looks to avenge its first ever loss to Colorado in the final meeting of the season. This Season: This is the first meeting between these teams. Note: The Storm, who have won six straight United Bowls, are fighting just to make the playoffs this season. The Storm are 11-2 overall, 5-1, and 3-0 in inter-conference play. 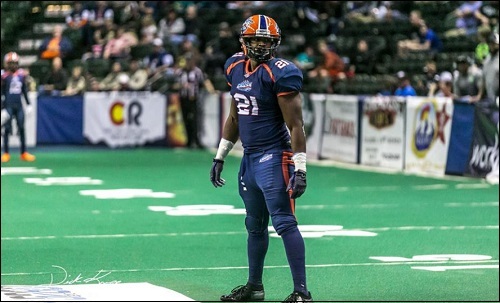 Sioux Falls is coming off a 36-21 home loss to the Wichita Falls Nighthawks on May 27. They are averaging 48.6 per game and are allowing 28.9 per game. The Storm are tied for first in the United Conference. The Crush are 3-10 overall, 2-4 at home and 1-1 in inter-conference play. Colorado is coming off a 48-43 road loss to the Spokane Empire on May 26. They are averaging 38.8 points per game and are allowing 51.5 points per game. The Crush are fifth in the Intense Conference. Note: Roster information is subject to change and is presented here as a basic guide for following the game. Roster information is gathered from the IFL, the teams' official websites and other sources. The Storm are seeking their seventh straight United Bowl championship. The have been the dominant IFL team for several years. Last season, they faced the Spokane Empire, winning triumphantly. Sioux Falls just suffered their first home loss since 2010 last week against the Wichita Falls Nighthawks. The Storm control their United Conference playoff destiny. If they win their final three games, including this one, they are in., It is possible that by winning two of those three, they could get in. Ironically, if both the Iowa Barnstormers and Wichita Falls Nighthawks win out, the Storm will find themselves at home watching the playoffs on Youtube. Lorenzo Brown is a solid quarterback. He is a dual threat who completes nearly 61 percent of his passes and has 29 touchdown tosses. Where he does the most damage is on the ground. His 4.5 yards per carry is solid and he has 18 touchdowns to show for it. What makes Brown as effective as he is is that Robbie Rouse is in the backfield to compliment him. Rouse has 118 carries for 506 yards with 13 trips to the end zone. Korey Williams is the receiving leader with 32 receptions for 363 yards. Mike Tatum adds 28 receptions for 297 yards and six touchdowns. The Storm have a strong defense with Tyler Knight leading the way with 91 total tackles. Matt Hermanson and Elijah Fields each have five interceptions, and Khalif Mitchell leads the team in sacks. The Storm are forcing just under three turnovers per game. Sioux Falls is not used to losing, and last week's home loss will gnaw at them. Expect them to come out hungry. That means their defense would need to step up as they have all season. The Crush are playing for fourth place in the Intense Conference. There are no playoff hopes at this point. The reason to watch this team is to see the players play. 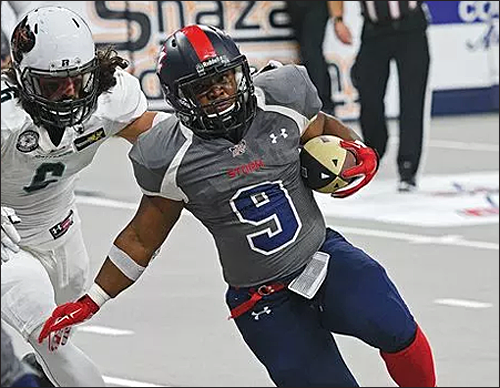 The IFL is a stage for these players to play in front of scouts, get game film to submit to potential teams in other leagues, and to play for some pride. No team wants to be the bottom dwellers in the conference standings. They have an uphill battle to gain some more respectability. Colorado has wins against Intense playoff hopeful Wichita Falls Nighthawks, as well as against the Salt Lake Screaming Eagles and Spokane Empire. The face the Nighthawks in Wichita Falls next week and the Rattlers in Loveland in the final week of the season. Sean Goldrich has completed 53.4 percent of his passes for 936 yards and 20 touchdowns. He missed four games this season, but has regained the starting nod. Josh Ford is one of four players to appear in all 13 games this season. He has 89 carries for an average for 3.2 yards and four touchdowns. His workload and production have increased over the past few weeks. Kaiser's 20 touchdown passes are among the highest in the IFL. The Crush will have to play error free in order to come away with a win in this one. Eliminating penalties will be the absolute key if they are to defeat the six-time defending champions, who are looking to make a return trip to the United Bowl..
June 3 - Nebraska Danger (7-6) at Cedar Rapids Titans (1-13), 5:05 p.m.
June 3 - *Wichita Falls Nighthawks (10-3) at Green Bay Blizzard (2-12), 5:05 p.m.
June 3 - *Arizona Rattlers (9-4) at Spokane Empire (8-5), 7 p.m.
* indicates a conference game. All times are pacific. Last week, the Crush scored a sort of trifecta. Despite the 48-43 loss to the Empire, they had three players in week 15 make the honorable mention list for the Indoor Football League's Offensive, Defensive and Special Teams Players of the Week. Offense: Wide receiver Kyle Kaiser caught three touchdowns amidst his seven catches for 68 yards. Defense: Linebacker Azziz Higgins had six total tackles, and forced a fumble which he returned 49 yards, just short of a score. Special Teams: Kicker Miles Bergner, in his first game with the Crush, made both of his extra point attempts. He also made three of his four field goal attempts, including a 53 yarder. Why is the Storm radio broadcast playing? I thought Troy and Aaron were calling the game. Sometimes they do that. I would have preferred Aaron and Troy too. I can't remember when the last time Troy and Aaron called a game was. That is not how it should should be. Should have been interference but we'll take the unsportsmanlike. 1st and Goal and the Crush blow it. GREEEEAAAATTT. Ugly beginning to this game by both teams. Like the Screaming Eagles last night. Riggs isn't gonna be happy about that drop. Apparently the Crush have no run D right now. I hope the offense can step up. Great return. We needed that. Touchdown Storm. Korey Williams 5 yard run. Justin Syrovatka kick. Touchdown Storm. Justin Syrovatka kick. I missed the actual scoring play and the stat page is apparently not being manned. Josh Ford wants to win this game. I like it. Touchdown! A tie game going into the 2nd quarter? This is unbelievable.